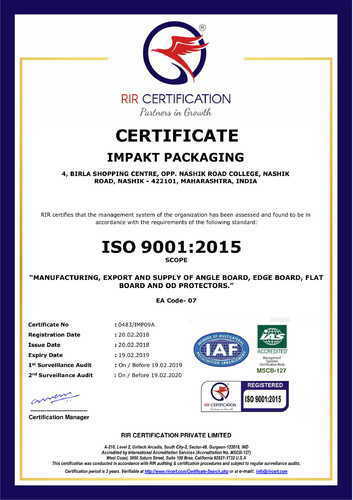 We, Impakt Packaging started in the years 2000 are one of the foremost manufacturers and exporters of an extensive array of Angle Board, Edge Board and much more. Our offered range consists of best grade Angle Board, Edge Board, and Flat Board. All offered ranges are made in conformity with the universally accepted standards of quality. Owing to their durability, sturdy design, and resistance to crack, these are appreciated among our patrons. Apart from this, we are offering these products at very reasonable rates in the market. Under the headship of our mentor Mr. Pramod Kabra, our organization is moving ahead in this cutting-edge competition. Owing to his excellent managerial skills, optimistic attitude and deep knowledge about this area, we have been proficient to carve a niche in this very competitive domain. Be the number one provider of customer value in Packaging Field & Service Industry. We have with us dedicated team of quality checking personnel who assist us in successfully conducting random inspection of raw materials. After ensuring their conformance to laid down production guidelines, they also conduct in-process checks at different production stages. Further, they also check the finished range of packaging material, associated packaging accessories and inks for printing machines, waterproof coatings, binders and additives; and water-based emulsions. This is done before and after packaging to ensure the shipped consignment is exactly as per the specifications provided by the clients. The assistance provided by cutting-edge process technologies during the entire stage of manufacturing process as well as service support provided by highly qualified workforce also assist us in maintaining high finish standards in the offered product range. Strengthen our market leadership by creating dynamic and profitable relationships with customers and suppliers through innovative solutions and committed employees. We have with us strong team of professionals who have with them extensive understanding of the packaging and protective packaging product requirements. Their seasoned approach as well as strong hold over the involved production related processes ensures the specifications as demanded by the customers are successfully met. Our marketing team also plays an important part by maintaining close coordination with customers and production unit to ensure prompt deliveries in shortest possible lead times. We are well known for our consistency in delivering quality product range that includes packaging material, associated packaging accessories and inks for printing machines, waterproof coatings, binders and additives; and water-based emulsions. Last 14 years, Impakt Packaging has been an epitome of constant growth and empowerment. While Impakt Packaging has been striding towards the Numero Uno position in the Packaging & Service industry, it is also making a mark in sectors like Packaging through which it has been fuelling the nation’s growth and creating a sustainable future for the country.